Lock in a great price for Holiday Inn Express Portsmouth Gunwharf Quays – rated 8.3 by recent guests! 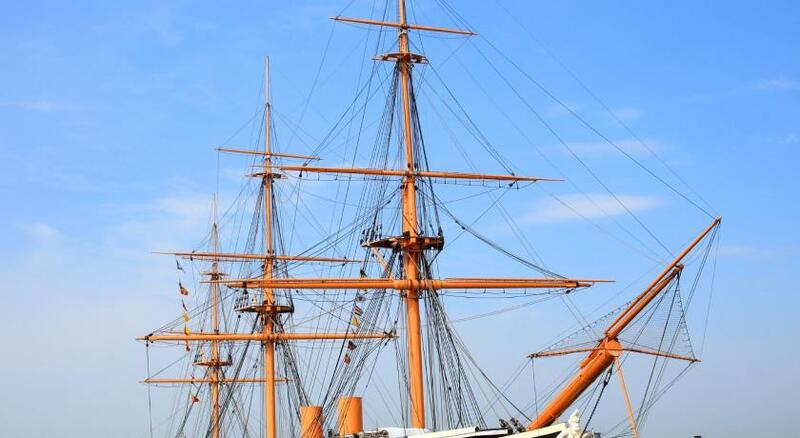 Very walkable to The Historic Dockyard. Thoroughly recommend The Old Customs House restaurant. The location is fantastic for all Gunwharf Quays shopping and restaurants. The parking is underground and so easy to shop and return to the car to drop bags off, instead of lugging them to the room and back out again ! - Staff are friendly and helpful. Location offered shopping and great restaurant options. Loved the bar in the lobby. Internet great! Great location. An easy walk from the train station and in the heart of shops, restaurants, and dockyard attractions. Great breakfast. Friendly staff. Holiday Inn Express Portsmouth Gunwharf Quays This rating is a reflection of how the property compares to the industry standard when it comes to price, facilities and services available. It's based on a self-evaluation by the property. Use this rating to help choose your stay! 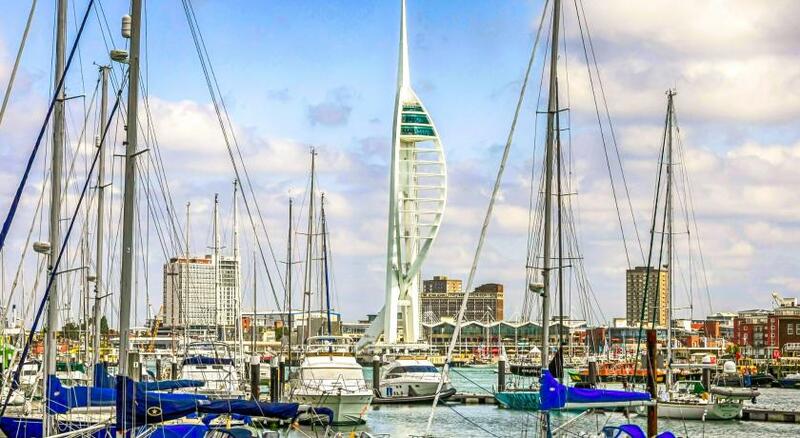 One of our top picks in Portsmouth.Superbly located in Portsmouth’s lively waterfront development, Gunwharf Quays, this hotel offers bright, modern rooms with buffet breakfasts. Stores, bars and restaurants are on the hotel doorstep. Spacious rooms at this Holiday Inn Express all have a TV with pay-per-view movies, tea/coffee and a telephone. All bathrooms are equipped with power showers, while some rooms have views of the docks. Gunwharf Quays has a vast number of attractions, including designer shops, a cinema, bowling, a casino and a comedy club. Downtown shopping is half a mile away. 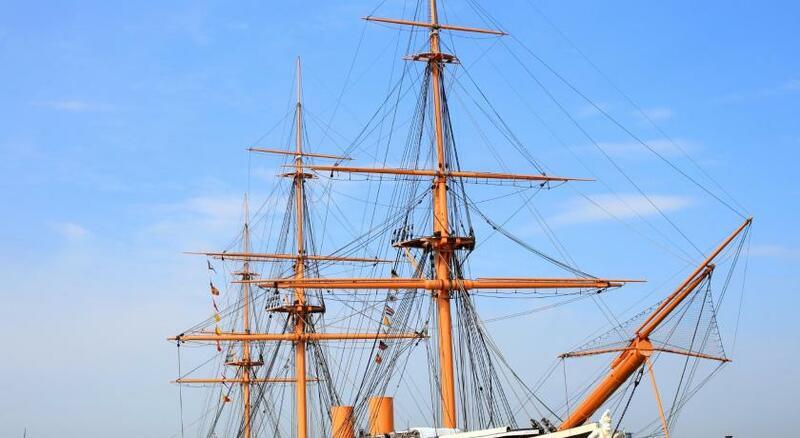 Portsmouth's historic Dockyard and the waterfront, filled with traditional pubs and restaurants, are both a 10-minute walk away. The nearest train station is a 5 minute walk from the hotel. The breakfast area is located in the relaxing lounge and a continental breakfast is available each morning. 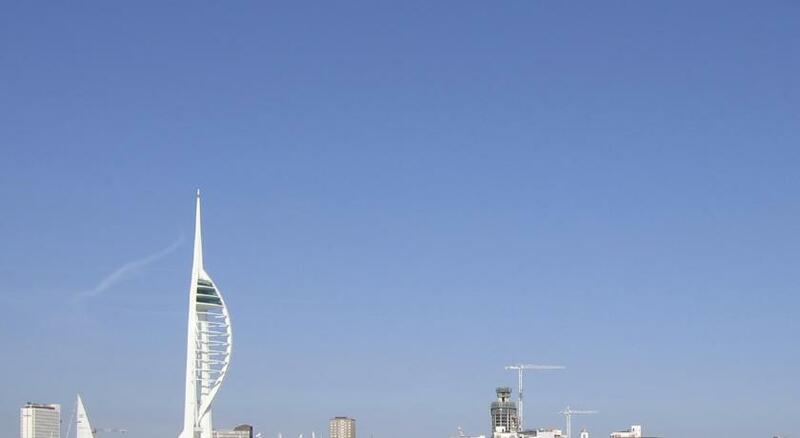 When would you like to stay at Holiday Inn Express Portsmouth Gunwharf Quays? A 26-inch flat-screen TV, private bathroom with shower and tea/coffee making facilities are features in this room. This double room has a cable TV, electric kettle and seating area. House Rules Holiday Inn Express Portsmouth Gunwharf Quays takes special requests – add in the next step! Holiday Inn Express Portsmouth Gunwharf Quays accepts these cards and reserves the right to temporarily hold an amount prior to arrival. If you expect to arrive outside reception opening hours, please inform Holiday Inn Express Portsmouth Gunwharf Quays in advance. Pets are not allowed, but guide dogs are accepted. Undercover private parking is available at the main Gunwharf Quays Car Park. Up to 2 children under the age of 18 stay free when sharing a room with up to 2 adults if suitable accommodations is available. No shampoo and conditioner, towels smelled like bleach. Comfortable bed and pillows, friendly staff. Breakfast room small and not much seating available. Great location. Very comfy bed and everything clean. Room and plumbing very quiet. Staff helpful at reception and breakfast. Table clearing/cleaning service during busy breakfast period could have been better. Very convenient for event in Gunwharf. Good breakfast and excellent vale for money. Cleanliness and the location. Perfect for a night out on the quays. No dry rose wine at bar only sweet which was a disappointment would of stayed in the bar longer if it was available as only drink dry rose wine. No tomatoes at breakfast but that’s all otherwise very good . Very friendly staff, fantastic location , staff very approachable and helpful.